Right in the heart of Denver, on the grounds of the reclaimed Stapleton Airport, is a twenty three acre working urban farm. Students of the University of Colorado Denver built these two tremendous projects to enhance the farm's operation as well as to make a definitive statement about sustainable design as a part of the FEED Denver program. Using mostly salvaged materials the team put together a high design public gathering shelter and milking shed that do not easily give away their humble use or materials. The project is headed by the two principals of Studio HT as part of a class of the Design Build Program at the University of Colorado Denver. 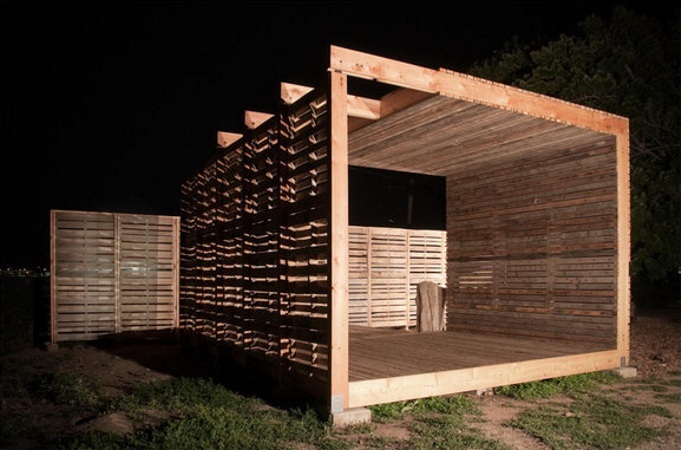 The Learning Cube is a simple framed structure with shipping pallets as infill. While the materials are rough the careful construction and design give it a refined presence. The building is a gathering point to hold meetings and classes, sell produce, and to get out of a blazing Colorado summer sun. The Dairy House is a refined vision mixing a variety of reclaimed material such as stone, iron and wood to provide a classy place to milk goats. The gabion steel boxes hold demolished concrete which support the exterior seats. An incorporated pen and milking platform complete the highly functional building. The building speaks to contemplation as much as it does to work. Together the projects inform a large audience about how green building practices can duly enhance both the financial and aesthetic value of a structure via good design. The project is headed by the two principals of Studio HT as part of a class of the Design Build Program at the University of Colorado Denver. The Learning Cube is a simple framed structure with shipping pallets as infill. The Dairy House is a refined vision mixing a variety of reclaimed material such as stone, iron and wood to provide a classy place to milk goats. 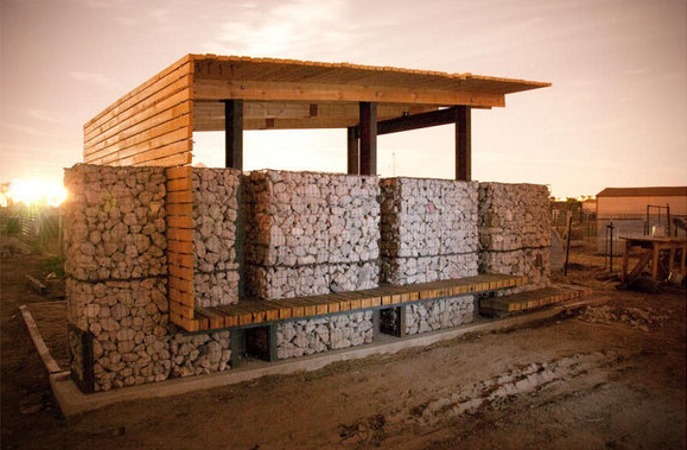 The gabion steel boxes hold demolished concrete which support the exterior seats. The building speaks to contemplation as much as it does to work. An incorporated pen and milking platform complete the highly functional building. Detail of the materials aesthetic interaction. The Learning Cube is a simple framed structure with shipping pallets as infill. The building is a gathering point to hold meetings and classes, sell produce, and to get out of a blazing Colorado summer sun. Together the projects inform a large audience about how green building practices can duly enhance both the financial and aesthetic value of a structure via good design. Detail of the Learning Cube construction. 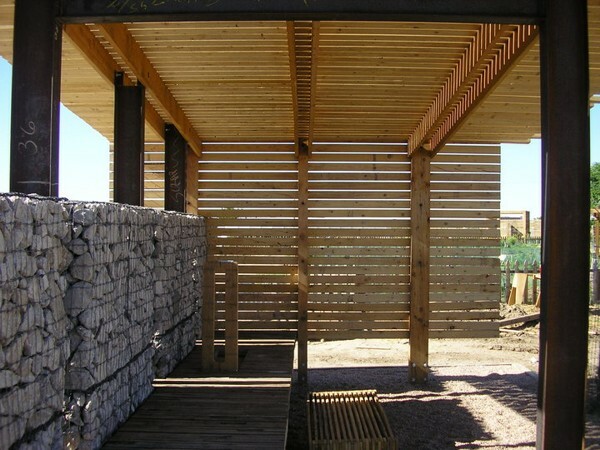 The project relayed on simple reused materials like these pallets, crushed concrete and iron I-beams.